The important message was delivered by a foreign ministry official, not Kim Jong Il. The official read out a written message from the Dear Leader, stating Kim’s willingness for “unconditional talks” for the nuclear issue and holding a summit with South Korean President Lee Myung-bak — neither of which are new proposals. “Carter was used by North Korea like a fool,” said Toshimitsu Shigemura, an expert on North Korea at Waseda University in Tokyo. “Firstly, he couldn’t meet Kim Jong Il. Secondly, there was no progress on the nuclear standoff. Thirdly, he just brought with him a message by Kim Jong Il to the outside world, as if he were a messenger of North Korea,” Shigemura said, adding that the only reason North Korea hosted Carter was in an attempt to draw food aid from the United States. Oh well. 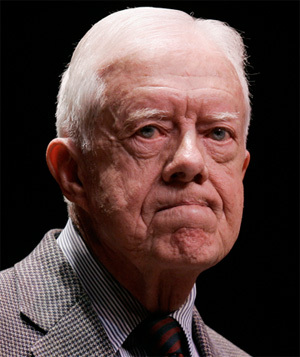 Ex President Carter may not care much about losing face — for himself or for the United States. Might he not even understand the concept? It’s not peanuts in Asia. “I think it is counterproductive of Carter to describe Seoul and Washington withholding food aid and that was human rights violations,” said Brian Myers, an American expert on Korean affairs at Dongseo University in the South Korean city of Busan. It’s not just Washington and Seoul which held low opinions of Carter’s visit. Even Wu Dawei, China’s front man on Korean affairs, said of Carter’s visit: “What Carter is thinking is Carter’s thinking only,” South Korea’s Yonhap News reported Saturday. China is host to the North Korean nuclear talks, aimed to persuade North Korea to give up nukes. It didn’t appreciate Carter’s attempt to “steal the ball,” the report said. Nor did Secretary Clinton think much of the visit, and neither did South Korean Foreign Minister Kim Sung-hwan. It’s almost (but not quite) enough to make one feel a bit sorry for the ex-president. I’m almost inclined to believe that senility has set in, except I’d have to believe that senility set in some time around 20 Jan 1977. Jimmy Carter is a bit like a doddery old uncle. A man of high intelligence and great accomplishment who soared very near the sun, admittedly getting his wings singed on occasion, now stumbling around unable to remember where the refrigerator is. It’s easy to make fun of him, but all of us are headed there, if we live long enough. In truth, he isn’t doing much harm. It may be embarrassing to see an ex-president get snubbed by a tin-pot dictator or to see him say really stupid things about the Middle East, but compare that to the bizarre behavior of politicians now in office. Carter may have been a brilliant nuclear engineer, but when it comes to dealing with people, I’m thinking that he shares berthing with Dr. Smith and Robot. I can’t imagine anything but an astonishing level of hubris on his part to keep involving himself in such endeavors. I don’t think it’s hubris so much as a stubborn effort to resist the approach of that dark night. But no doubt, he always had that engineer’s inability to tolerate fools well. I think he wants to remain relevant, and that’s understandable — even though he’s often not right. If he is so intolerant of fools, I wonder why he keeps going on these little jaunts to try to bargain with despots. Is there anything more foolish than trying to bargain with murderers and thieves, with tin-pot dictators? As I said, he’s like our doddery old uncle. Judgment slips away along with everything else. Until he started openly praising the Palestinians and condemning Israel a few years ago, plus flirting with Kim Jong-il, he wasn’t so bad.